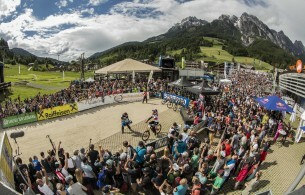 The Austrian ski resort of Leogang, at the heart of Austria’s famous Skicircus, is again attracting thousands of adrenaline sports fans – this time for the UCI Mountain Bike World Cup – on Sunday June 11. The world’s fastest riders will once again challenge each other on the huge jumps, high-speed sections, rocks and roots. This highly difficult line has produced legendary outcomes in the past two years. In 2014 Aaron Gwin (USA) managed to conquer the trail with a flat rear tyre, but last year he even topped that. Although his chain snapped, Gwin not only made it all the way down, but also sent the fastest run of the weekend, which secured him the win. 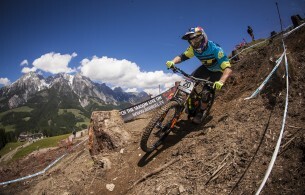 Last year, Leogang was again good ground for Britain’s World Champ Rachel Atherton – for the tenth consecutive time Rachel, from Salisbury, climbed to the very top of the podium – a new world record! Rachel is again in heavy training for this year’s finals, and hopes to repeat her winning ways. And biking’s downhill fans will once again see, how bikes withstand the test and who ends up being the fastest rider of the day.